For two years now, the presence of the “blue dollar” has indicated that the Argentine peso has been seriously overvalued in the foreign exchange market, Argentina’s clumsy foreign exchange control measures and other erratic policies have driven the US currency into ever-higher territory. 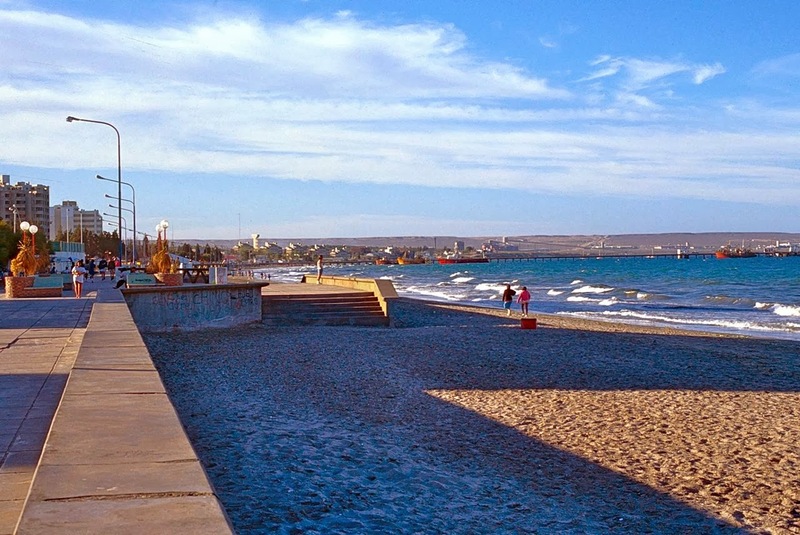 This came to the fore last week as I sought to change money in Puerto Madryn (pictured above), whose only exchange house (pictured below) was offering the official rate (interestingly, the English word dollar derives from the German Thaler). 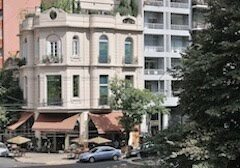 I tried my usual real-estate broker tactic, but that didn’t work and then I tried a travel agency, where I got an offer of nine pesos – despite the strong dollar, substantially less than the 10 I had gotten in Villa La Angostura and Neuquén. While visiting a friend who works in Madryn’s municipal tourism office, I asked whether she might have any suggestions, and she told me not to expect much. Nevertheless, she gave me an unconventional suggestion to visit a glass merchant whose unprepossessing polarized facade gave no indication of what was inside. Entering a small foyer where a young woman stood behind an elevated counter, I asked if I might sell dollars there. She responded that her boss was unavailable, but suggested I return in half an hour, which I did. She then said she would have to fetch the cotización (the day’s rate), and returned shortly with a quote of 11.10 pesos to the dollar, the best I have yet gotten. She then ushered me into another room, where I counted out US$500 in Benjamin Franklins. Taking the bills, she left briefly and returned with five bundles of ten 100-peso banknotes, each held together with a paper clip. We counted them out carefully and, the transaction included, I left with a thank you – never having met her boss face-to-face. This was on Wednesday the 22nd, when the peso was under pressure and the blue rate skyrocketed to 12 and then 13 in Buenos Aires. That also unnerved the government, which has announced vague (and probably changeable) measures to permit Argentines to purchase dollars once again, despite dwindling reserves that have raised questions about the country’s ability to meet foreign debt obligations. On Friday, the official peso fell to nearly eight per dollar and, given the vagueness of the dollar purchase plan, the blue dollar briefly entered a state of suspension, falling below the 12-peso mark. Since officials revealed the details this morning, though, it has once again risen above 12. 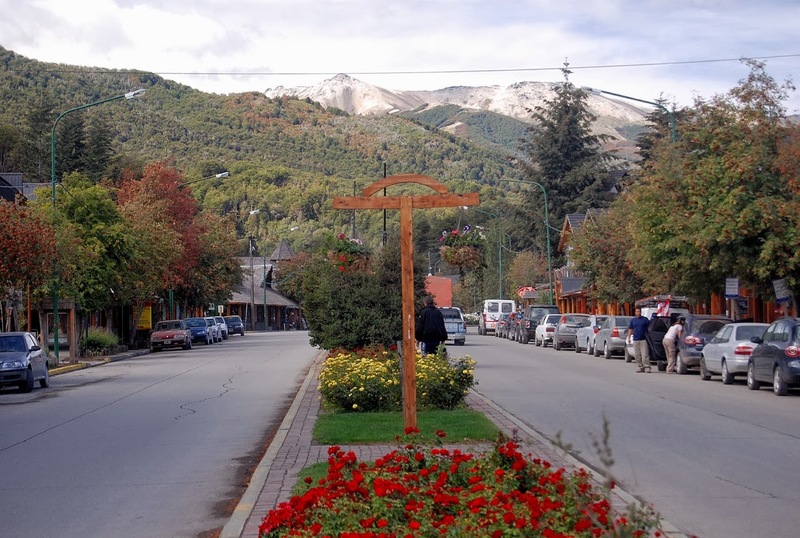 I’m about to return to Chile, so I had no urgent need to change, but I did sell US$200 to friends in Esquel because, when I return to Argentina, I’ll be entering a thinly populated area where even finding an ATM may be a challenge. 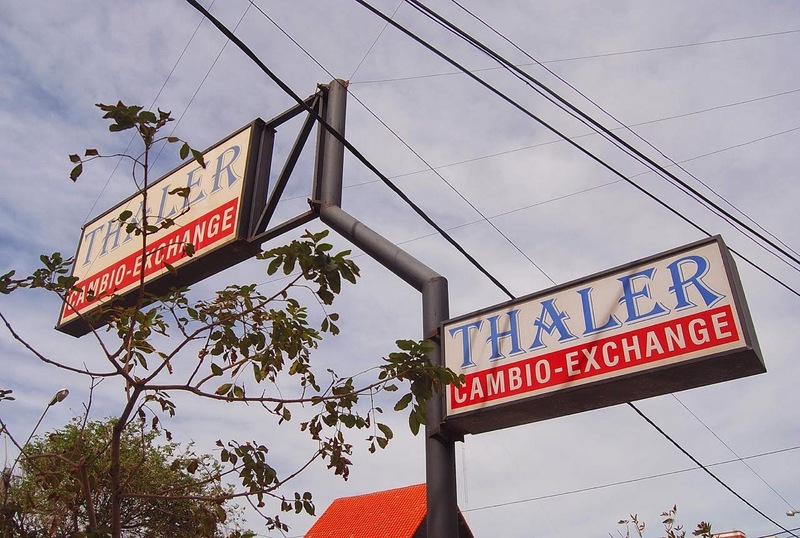 The rate was a little uncertain when we did the transaction, and we compromised at 10.50 pesos. It’s worth noting that the Chilean peso has also declined recently – from 520 per dollar when I flew to Santiago in mid-November to 550 per dollar as of Friday. Chile, though, has an open-market foreign exchange system with no parallel peso, so this probably reflects recent weakness in the price of copper, Chile’s principal export, and a port strike that has reduced economic activity. Still, it looks to make my travel costs a bit lower when I cross the border. Though it may not look like much, Sierra Grande is still a welcome sight to southbound motorists on Argentina's Ruta Nacional 3, the highway that starts in Buenos Aires and ends, 3,200 km later, at Bahía Lapataia, in Parque Nacional Tierra del Fuego. That's because Sierra Grande is the northernmost point where motorists like myself can fill the tank at, "Patagonian prices," a discount from rates in the rest of the country. That's presuming fuel is available, which is no sure thing this summer. 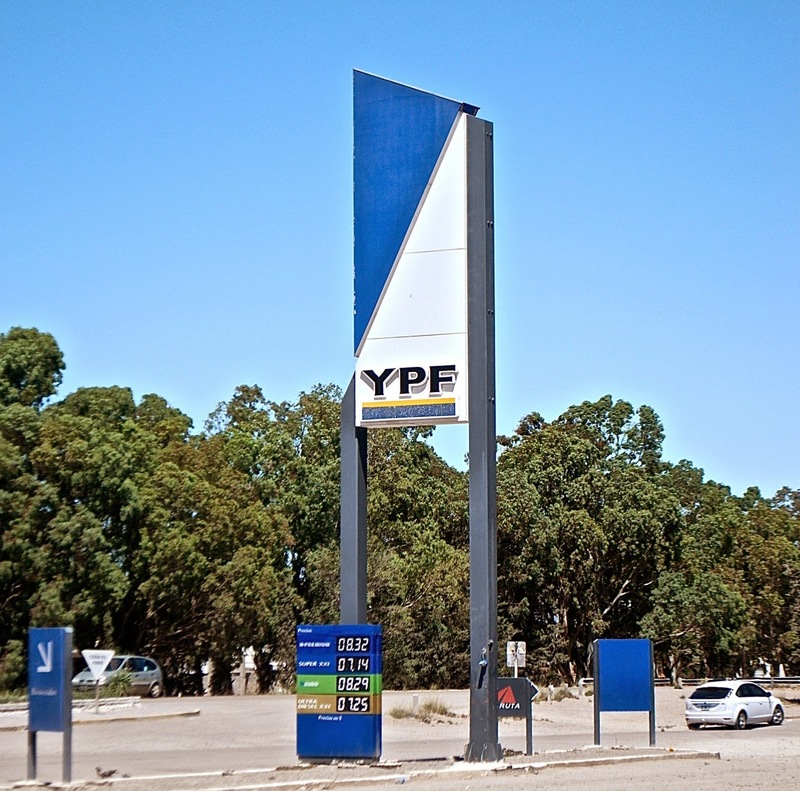 Monday morning, I left the city of Viedma with three-quarters of a tank, plenty to cover the 300 km to Sierra Grande, where I could fill up more cheaply. When I passed the city of San Antonio Oeste, though, I became a bit concerned – a little more than halfway to Sierra Grande, it had huge lines at its only service station, and I wondered whether northbound drivers had been unable to fill up there. 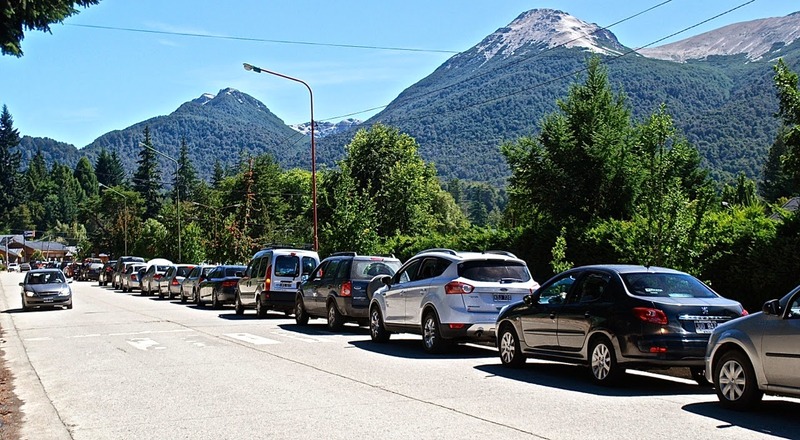 I’d already seen long gas lines in Villa La Angostura, San Martín de los Andes and elsewhere, so this might become an issue. As it turned out, my concerns were overblown. 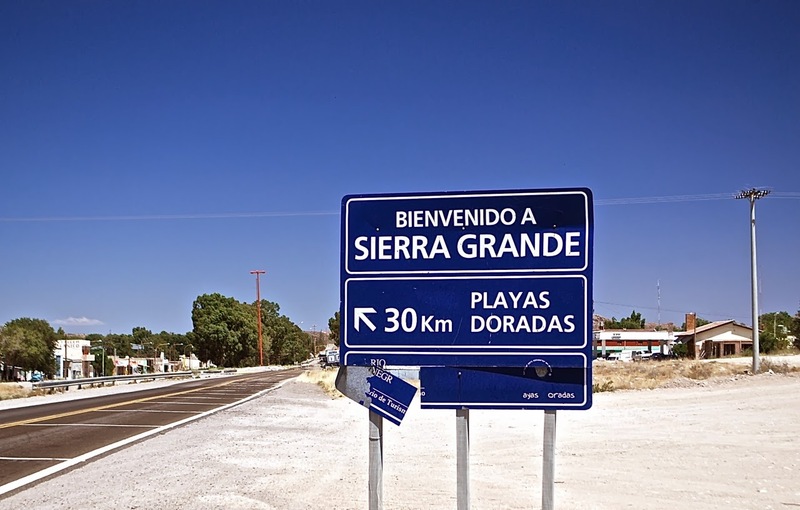 Sierra Grande has several service stations, and the longest was at the state-run YPF, which is the cheapest – high-octane super costs 7.14 pesos per liter (roughly US$3.94 per gallon at the official rate, but only $2.71 per gallon at the “blue dollar” rate). This is about 20 percent cheaper than fuel farther north. Some years ago, longer than I care to remember, “Patagonian prices” for fuel were barely half what they were in the rest of Argentina, thanks to a tax break that supposedly encouraged settlement and economic activity in this thinly populated part of the country. Given how the differential has declined in recent years, that may be on the way out and, in any event, the price doesn’t matter much if there’s no supply. 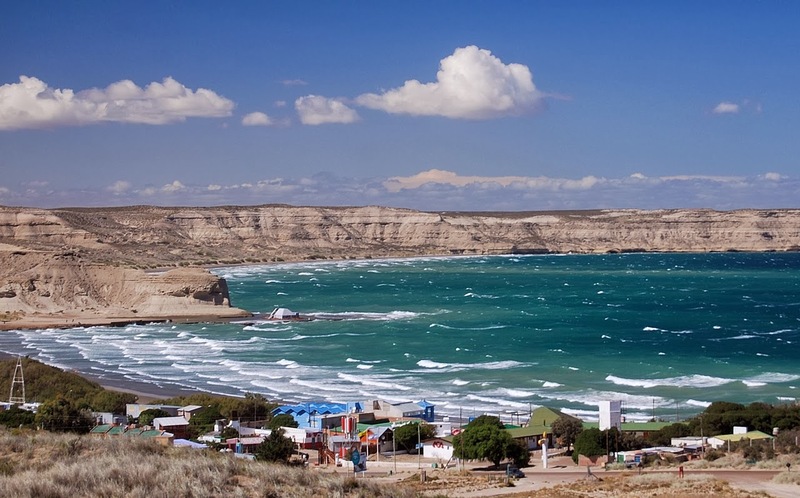 When I arrived at the village of Puerto Pirámides (pictured above), gateway to the wildlife paradise of Península Valdés, its only station had been without fuel for several days, with the nearest available at Puerto Madryn – a distance of nearly 100 km. 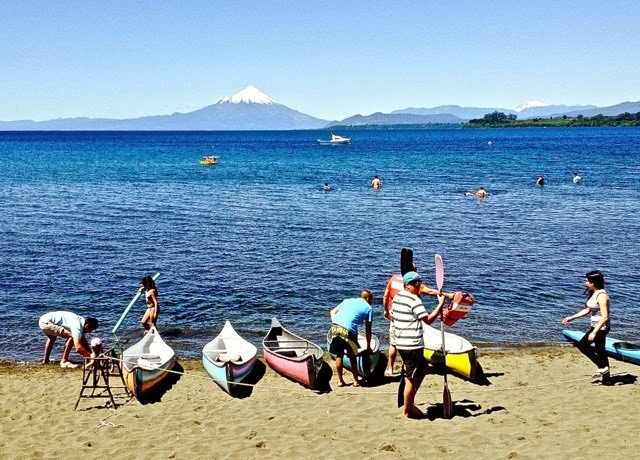 Shaped roughly like an equilateral triangle, Lago Llanquihue is one of southern Chile’s most visited areas, thanks to towns like Frutillar, with its Germanic charm, and Puerto Varas, with its distinctive architecture, exceptional accommodations and fine restaurants. 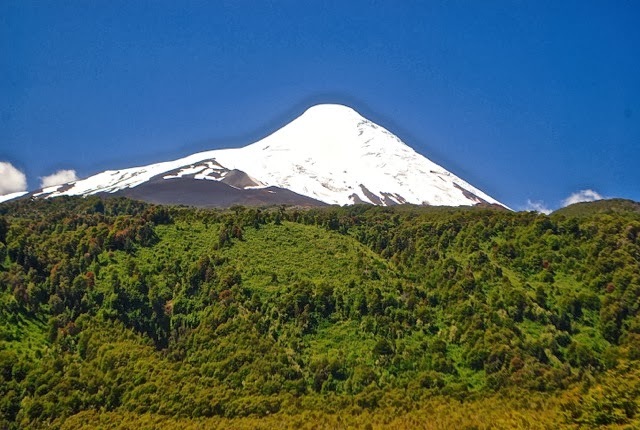 Both enjoy panoramas of Volcán Osorno, its snow-topped cone mimicking the perfection of Fujiyama. For more than a century now, the bus-boat shuttle from Varas across the Andes to Argentina has been a cornerstone of the local economy, but there’s another part of the lake that gets too little attention: from Puerto Octay, at its northern tip, a newly paved road follows the lakeshore southeast to reach the hamlet of Ensenada, where it meets the road from Puerto Varas. For a couple decades, I’d seen this road on the map but until a few years ago I had never driven the length of it – clearly it was scenic, but it was narrow, slow and mostly loose gravel. I often received letters from cyclists who told me about battling tábanos, the large but harmless horseflies that buzzed them as they pedaled up the hills (Except in early summer, when the flies are numerous, the road makes an ideal cycling route). Now that the road’s completely paved, though – other than one graveled stretch of just 300 meters – I decided to drive it again on a Friday afternoon in December. 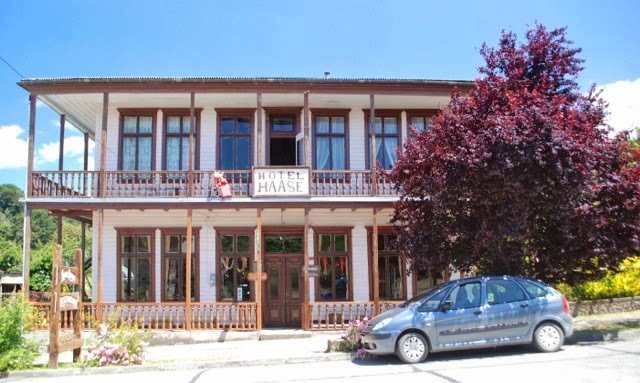 I started from Puerto Octay, where the density of German-style architecture may be greater than in either Frutillar or Puerto Varas – I loved the historic Hotel Haase, with its second-story wrap-around balcony. 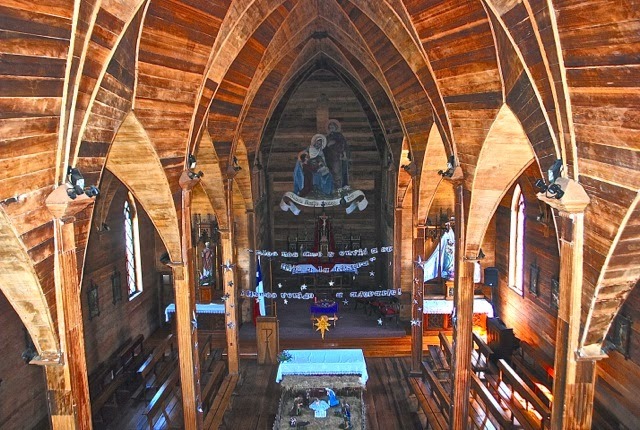 Beneath its steep-pitched roof, the arched interior of the Iglesia San Agustín displayed glistening woodwork and walls. I didn’t eat in town, but made a brief stop at the Casa Ignacio Wulf, another architectural landmark where Lácteos Octay lets visitors sample the cheeses at their retail outlet. Then I hit the highway to the southeast, foregoing the first paved segment to take a shorter gravel road along the lakeshore at Maitén, with Osorno’s symmetrical cone never out of sight. Just two days after Christmas, it was a balmy if breezy day, but only a handful of locals were enjoying the black sand beaches – in a week, though, they’d likely be packed. Beyond rows of conifers that yielded volcano views, the route continued through a dairyscape of Guernseys and close-cropped pastures to Puerto Fonck – one of numerous small ports that dotted the lakeshore in the days when even gravel roads were a distant dream. 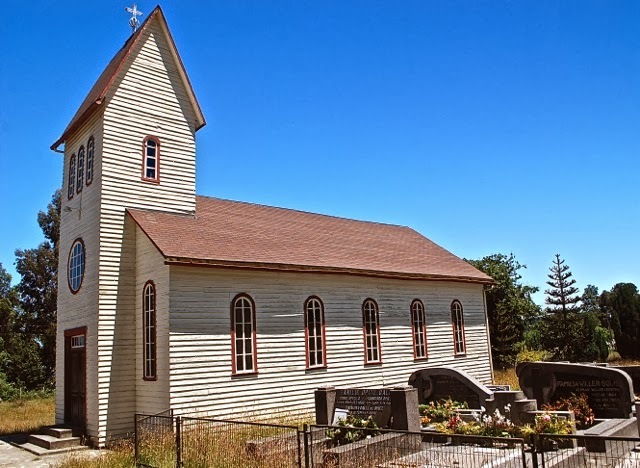 I stopped to see the steepled German church and restored graveyard, where all the tombstones bore surnames like Galle, Konrad and Opitz, before intersecting the paved road at Puerto Klocker. At Klocker, there’s a gravel turnoff to La Picada, where a good footpath lets hikers traverse the volcano’s northwestern flank to arrive at Petrohué, on Lago Todos Los Santos, where the catamaran crossing to Argentina starts. The paved route continues to Las Cascadas, a second-home beach community where I had hoped to lunch but, in the limbo period before New Year’s, I could barely find an open grocery for a chocolate bar that had to suffice until dinnertime. 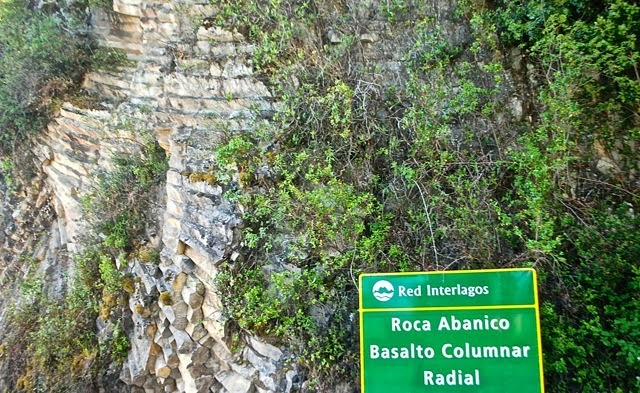 Beyond Las Cascadas there’s no public transportation, but the newly paved road – with a wide bike lane - hugs the shoreline even through some very rugged areas such as Abanico, where a cantilevered bridge overhangs the lake. 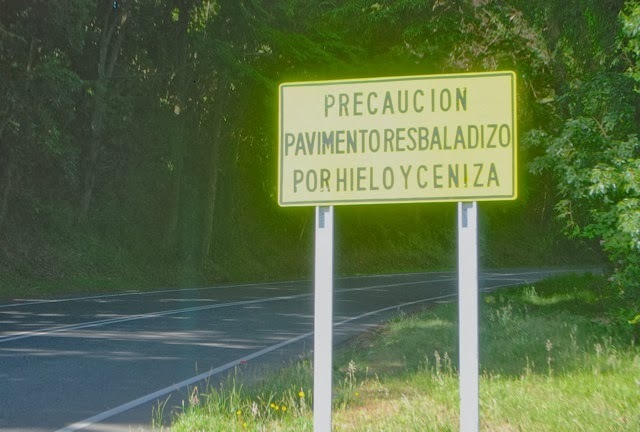 At a wider spot in the road, I pull off onto a wide spot and walk back to the bridge, where two Brazilian cyclists have arrived from Ensenada but decide to turn back because the tábano attacks are increasing (you can’t swat them when you’re on a bicycle, without risking a fall). 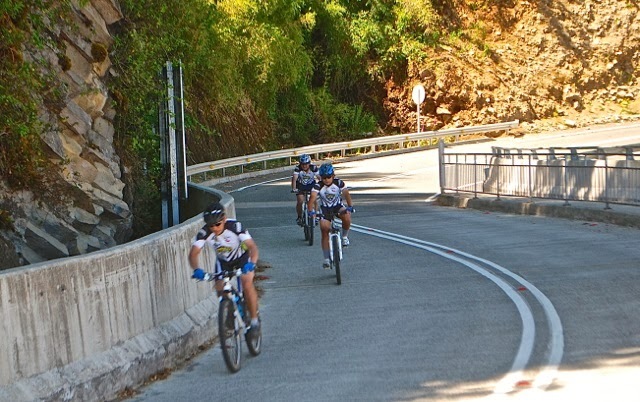 Other cyclists, though, continue to speed past me on the downhill segment toward Las Cascadas. Another reason I stop is because the road cut reveals an outcrop of columnar basalt, similar to others I’ve seen at California’s Devil’s Postpile and Wyoming’s Devil’s Tower. Abanico can’t match the size of those, but its distinctive polygonal landforms continue to fascinate me, even as I brush away the tábanos. 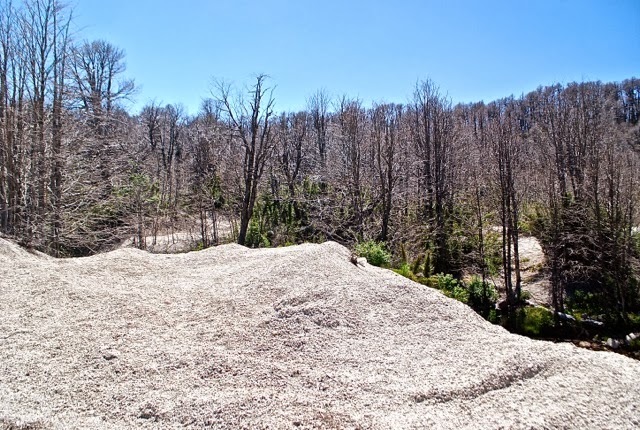 Beyond Abanico, the road soon enters Parque Nacional Vicente Pérez Rosales, Chile’s first national park, and there are several new pullouts along the road for different panoramas of the peak, which looms closer than ever. While the lakeside road proceeds to Ensenada, a steep but narrow paved spur climbs the volcano’s flanks, sometimes passing through forest so dense it feels like a tunnel, before emerging onto a treeless ski area. 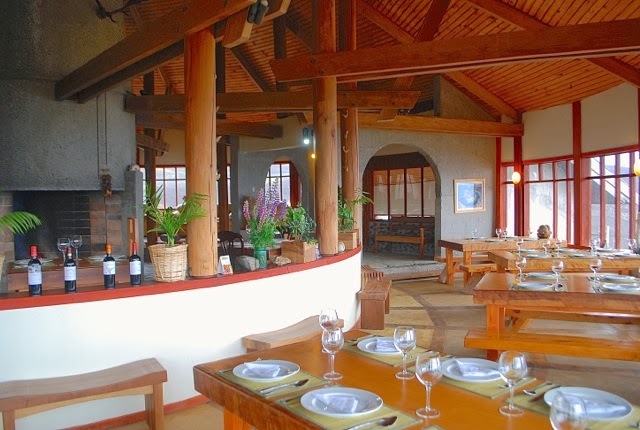 In summer, the lifts carry hikers into the high country but, if you don’t care to do so, there’s food at two restaurants, including the stylish new Nido de Cóndores (pictured above). Otherwise, at Ensenada, it’s a right turn back to Puerto Varas, or a left to Petrohué. Yesterday I crossed the Andes from Osorno (Chile) to Villa La Angostura (Argentina) for the first time since the Cordón Caulle volcano left the Argentine side of the border under a dense cap of ash that’s still visible along much of the international highway. It’s the only place in the world where I’ve seen warning signs that ice and ash may make the road surface slippery. I almost didn’t make it, though, even if that had nothing to do with the conditions – it was a brilliant cloudless day on both sides of the cordillera. Rather, I was late leaving Chile because of a bureaucratic snafu that was, in the end, my own fault. When I purchased my new car last month, I knew it would take some time for the title to clear – according to the notary where we completed the sale, between 20 and 25 days. It’s already been longer than that and, in any event, I left Santiago well before that time to be able to travel through the Chilean lakes district to update part of Moon Handbooks Patagonia. 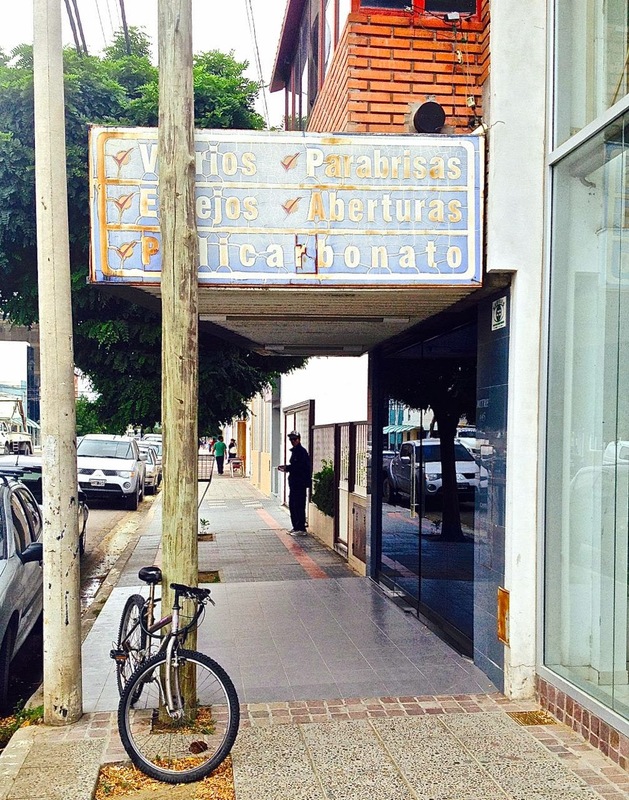 Unfortunately, when we left the notary’s, I overlooked a statement that the Pedido de Inscripción (request to change the vehicle’s title) would be available in a week’s time – well after I left Santiago. 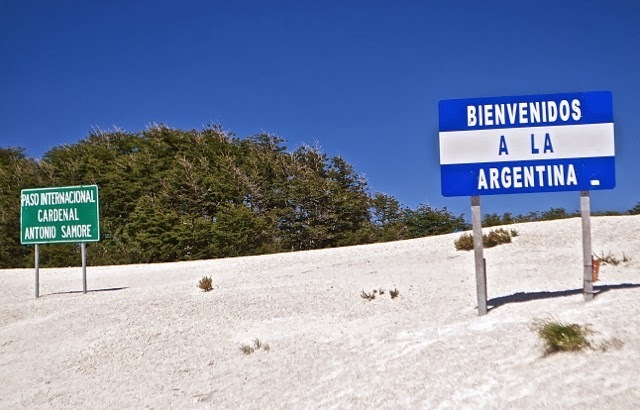 Without that document, and proof that I had paid for the title transfer, I could not cross the border into Argentina. Absent-mindedly, I had thought the bill of sale would be sufficient to get me across the border, but I was wrong. 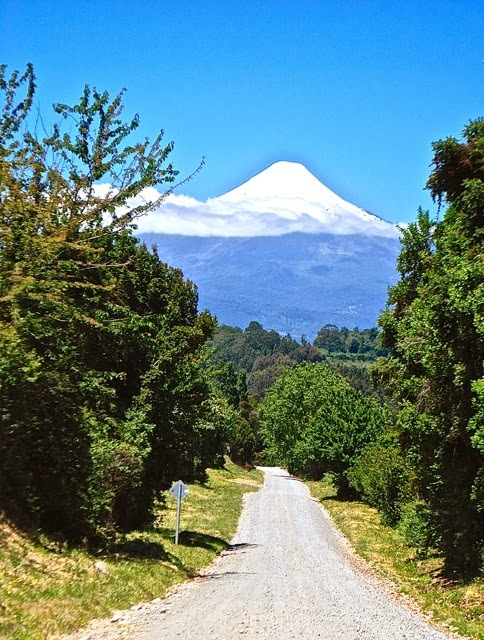 At Chilean customs, an official informed me I at least needed the title request and, briefly, I wondered whether I might have to return to Santiago or, at the very least, retreat down the mountain toward Osorno, where my cell phone would let me get in touch with the notary’s office. Then, apparently, I was saved. The same official who refused to approve my documents said I should speak with his superior, the superintendent of the Paso Cardenal Samoré border post. Clearly, superintendent Hernán Lausen (a Danish-Chilean with whom I could joke about my Scandinavian heritage) had dealt with such issues before, and he immediately accessed the civil register website to see whether the title transfer had gone through. It hadn’t yet and, again, my heart sank a bit. That wasn’t the end of things, though. Señor Lausen took it upon himself to phone the notary where we had done the transfer paperwork, and managed to get her on the line (fortunately, she hadn’t yet gone on summer vacation). Going beyond the call of duty, he asked her to scan the documents and send him a PDF which, in a short time, he printed out and delivered to me as I sat in the car. In just a few minutes, I was through the border post and rolling towards Argentina. The next time anybody complains to me about bureaucratic stonewalling, I’ll bring up the case of Hernán Lausen, the hero of my day, who clearly recognizes his duty to serve the public.